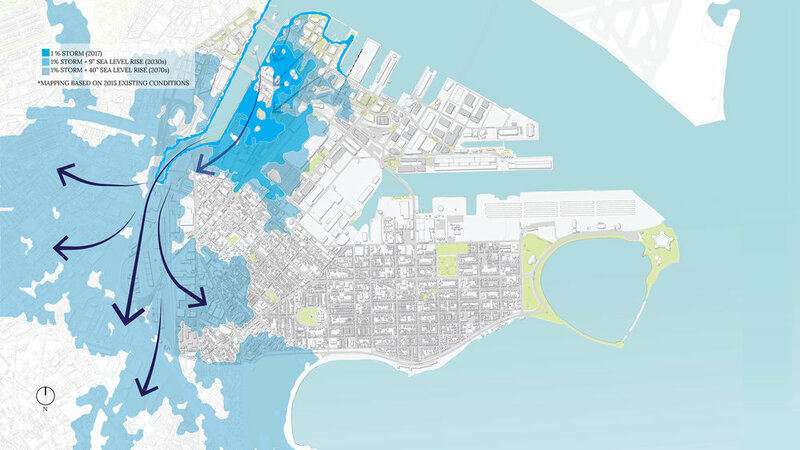 The South Boston-specific plan—developed by Arcadis, Halvorson Design, the Woods Hole Group, and CivicMoxie—Identifies major flood pathways in the district and outlines recommendations for protecting the city’s most vulnerable areas. Some of the recommendations outlined in the report include: re-envisioning the Fort Point Channel and Moakley Park to protect homes and businesses; creating a resilient park system through partnerships with property owners surrounding the Channel; completing the Emerald Necklace along Columbia Road to increase access to the waterfront; installing infrastructure to manage stormwater; and elevating transportation corridors to provide additional protection to residential neighborhoods. Though the recommended improvements could cost up to $1 billion to implement, they are expected to save the city up to $19 billion in damages. In addition to the release of Climate Ready South Boston, Mayor Walsh also announced Resilient Boston Harbor, a comprehensive city-wide resiliency plan to protect the Boston’s 47 miles of shoreline. This major undertaking would add 67 acres of open space along the water and improve existing parks to help protect low-lying spots. Seawalls would also be added and low-lying streets raised to protect the city from storms and create a world-class waterfront accessible to the public. 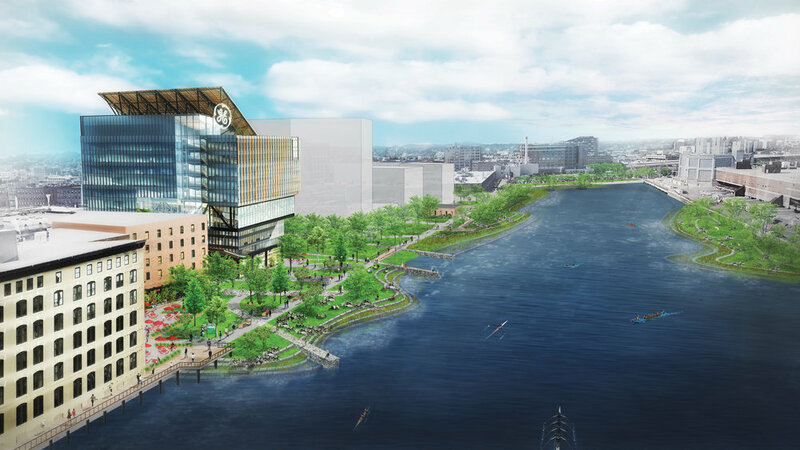 While there’s no specific cost tied to Resilient Boston Harbor, the city says that implementing the plan will require collaboration and funding from federal, state, private, philanthropic, and non-profit partners. Walsh also pledged to commit 10 percent of the city’s capital budget—roughly $16M per year—toward resiliency projects. “We’re not just planning for the next storm we will face — we’re planning for storms the next generation will face. This is a moment they’ll look back and judge us by,” Walsh said. For more coverage check out: The Boston Globe, Boston Business Journal, The Boston Herald, Biznow, and the City of Boston website. 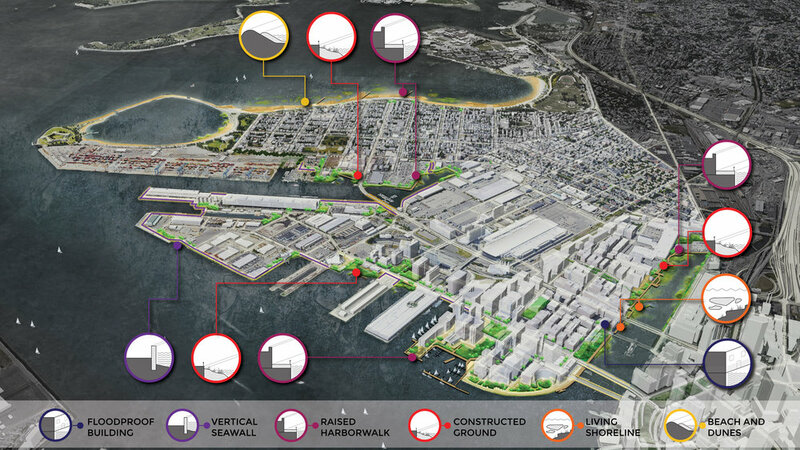 Click the following links to access the full Climate Ready South Boston report as well as Resilient Boston Harbor.